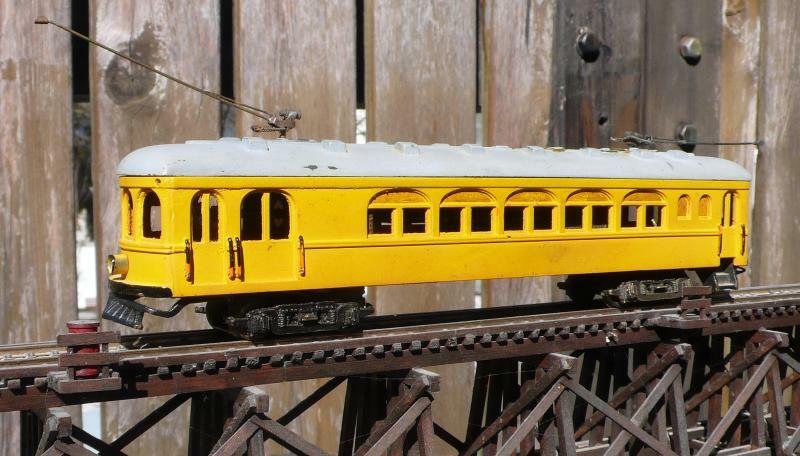 a derelict Interurban coach body that I will complete and set up to operate on DCC. First, a little background ... unfortunately, much of what I know is guesswork and incomplete. Frank Schlegel is supposed to have been a pioneer in HO modeling. 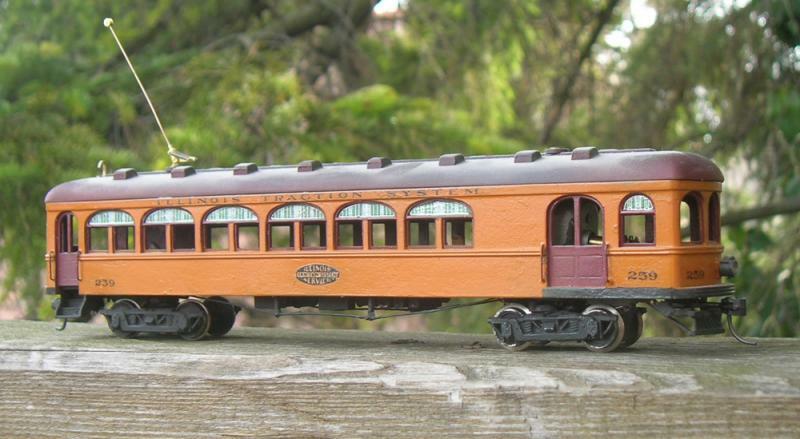 He was mentioned in old Trolley publications, and every few years one of his models shows up at evilbay. Apparently he choose the Illinois Traction as a prototype for his cars, most obvious at the model of the combine. The front and the turtle roof are pure IT, otherwise he took modelers license. This is my combine - bought it at Chicagoland Hobby twenty years ago, painted and completed it back then. I installed a modern Kleinbahn truck from an Austrian diesel hydraulic railcar. Then there was a box motor too... the IT never had one as elegant as this one. It came with an vintage Lindsay power truck. as I know of no way to insulate the brushes from the motor casting, so DCCing is impossible. Recently, I added another combine to my roster... it will be lettered for my private line. That's what I got... first it got a bath in boiling detergent solution to remove the old paint. Fabricated a floor from 0.8 brass sheet, and installed old Walther Baldwin trucks. 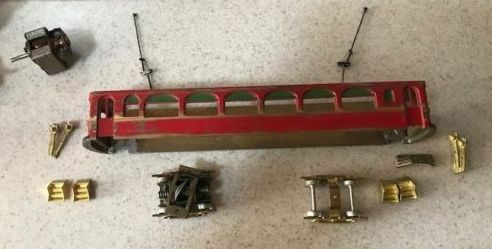 Regarding the roof, I was lucky to have some parts from a pirate copy of a Schlegel coach in my parts inventory. Often wonder about the legal background? Anyway, I had the required roof. Had to shorten it a little, looks good. Wonder how to finish it... maybe in traction orange, to match the IT combine, but lettered for my private line? A different and interesting project Gerold. Will the power pickup be overhead wire or just track? In spite of what many people say and think, it's perfectly legal to copy things like that. There is no inherent copyright in most physical objects. Whereas 2 dimensional representations of them are protected. slateworks wrote: A different and interesting project Gerold. To my dismay, I have to stick with two rail pickup. Seems DCC and overhead can't be combined. as the loco then would pick up current from the wrong rail. When I was a boy, I had a layout with a double track mainline and full operational overhead - miss this sorely. so thinking about erecting poles + catenary is moot. In spite of what many people say and think it's perfectly legal to copy things like that. Whereas as 2 dimensional representations of them are protected . Interesting... so there is no "intellectual property" on three dimensional objects? who modified and then duplicated commercial models in resin. Apparently there was no way to stop him doing so, as he is still in business. that his customers would have to buy a stock model first, to put the custom resin shell on it. So actually he would generate additional revenue for the manufacturer. As a DCC user that point never crossed my mind so something learned every day! AFAIK making copies of models for yourself is not regulated. But it is illegal to sell or give away said copies. Junk is something you throw away three weeks before you need it. Obviously, if I duplicate **something** (pictures, models....) in my dark basement nobody cant prevent this. that all the time, models are sold to the public, that are obviously copies. Maybe a lawsuit is so expensive and time consuming - with unpredictable results - that nobody risks it? Trademark would be like McDonald's or Amazon's logo. Copyright is printed material, movies, songs, and software. they should turn you away because it's copyrighted. Patent is usually for machines or a process. Generally last 15 to 20 years. Could I make a copy of an Athearn Blue Box boxcar and sell it? Well, I suppose I could, but is it really worth the trouble? Just run the numbers and the economics don't make any sense. and now it is no longer an exact copy. But, really, how many of the same part or piece do we normally need for a model? that supply us with all those neat items that we can't get along without. But, what you do in your dark basement is your business. I've always had a fondness for traction. Have quite a few books on the PE and other western electrics. 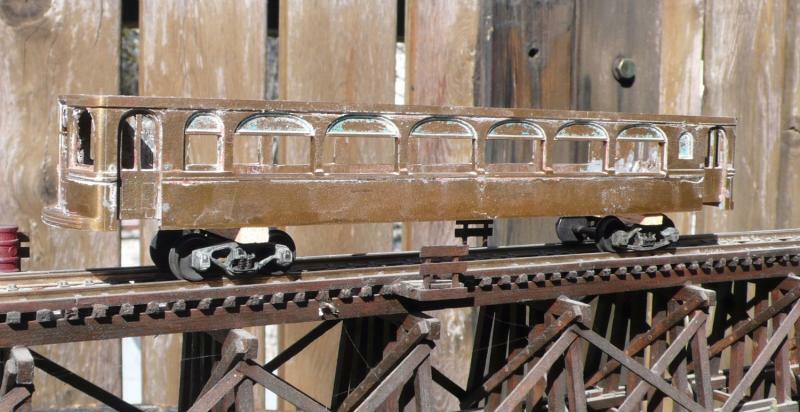 Even had a small HO trolley layout with working overhead. Not clear on the DCC problem with working overhead. even on DC, so there is no basic problem with DCC. However nothing else other than trolleys may run there. so it was possible to run two or even three trains simultaneously, the old traditional way. Train 1 uses both rails. Train 2 uses left rail + wire. Train 3 uses right rail + wire. Today, one of the big advantages of DCC is the easy way to operate reversing loops, and or Wyes. would fry the decoder when going through a loop or wye? DCC "circuit" #1 needs the rails, for diesels and steam. "Circuit" #2 uses left rail and wire... should work. this is impossible for obvious reasons. Maybe somebody with more electrical knowledge than me can tell it better. however in case of erroneous operation, there is no decoder to smoke up. Hope my English, and electrical terminology, was sufficient to explain my thoughts?